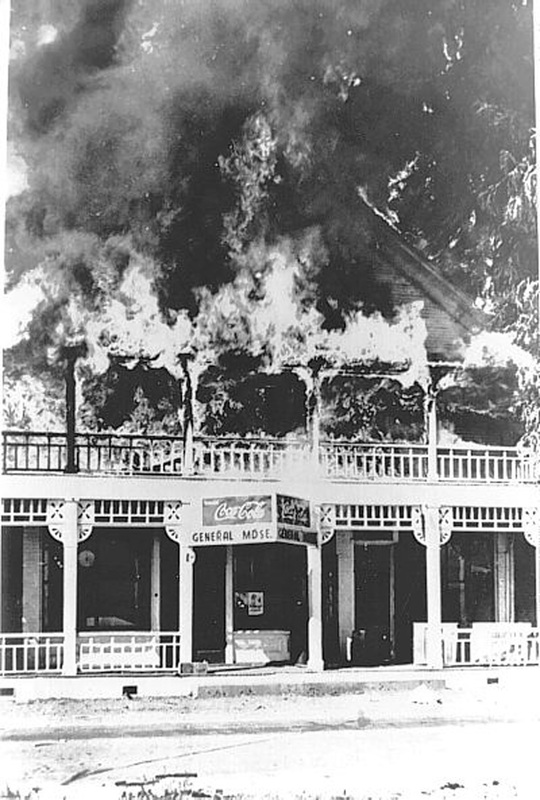 SCVHistory.com AP2217 | Acton | Acton Hotel Burns Down, 10-19-1945. The demise of the Acton Hotel, built in 1890 by Richard F. Nickel, was captured for posterity on the night of Friday, Oct. 19, 1945. The fire, which broke out in the attic, was suspected to be arson, but it was not proven. Samuel H. Schorr, wartime owner of the Acton hotel, returned from military service in 1945 to find that many of the furnishings and supplies he had left behind at his hotel and store were missing. He accused the man he had hired to run the business in his absence, Clarence Rush, of theft. Rush, the town postmaster, was arrested; he was arraigned on Thursday, Oct. 18, 1945, and released on $2,000 bond. The next night at 9:20 firefighters were alerted that the Acton hotel was on fire. By the time they arrived on scene it was too late. Rush's preliminary hearing on the grand-theft charge was scheduled for Dec. 7, 1945. The district attorney moved to dismiss the case for lack of evidence — and because the accuser, Schorr, failed to appear in court. Richard E. Nickel was 31 years old when he pulled into the tiny Acton train station for the first time on Oct. 11, 1887. He became the town's second resident  second only to his father-in-law, an entrepreneur named John F. Duehren, who had built the '49er Saloon in 1870 to serve the miners and prospectors of the nearby canyons in the northeastern Santa Clarita Valley. Soon known as the "Father of Acton," Nickel was instrumental in establishing most of the amenities a small frontier town would need. Employed as an agent for the Acton station, he built a general store with his family residence above, and became the first Acton postmaster when he moved the Soledad Post Office into his store on Jan. 24, 1888. On July 15, 1891, Nickel published the first edition of the first Santa Clarita Valley-based newspaper, The Acton Rooster, which came out on the 15th of each month for 22 years. On Nov. 2, 1891, Nickel established the valley's first water company, Acton Water Works. In March of 1900, Nickel was appointed port warden of San Francisco Harbor by his friend, California Governor Henry T. Gage, who had interests in a number of famous gold mines near Acton. Nickel left town but continued to publish the Acton Rooster from afar. He died in 1922. In 1890, Nickel completed his Acton Hotel, a lavish, two-story Victorian structure with a loft. Governor Gage entertained several political allies at the hotel, most notably Presidents Theodore Roosevelt and Herbert C. Hoover, as well as the King of Spain and attorney Earl Rogers. The hotel mysteriously burned to the ground on Friday night, Oct. 19, 1945. AP2217: 19200 dpi jpeg from copy print (needs rescan).